Stick this in your comedy pipe and smoke it! Some ace stuff coming up this month! 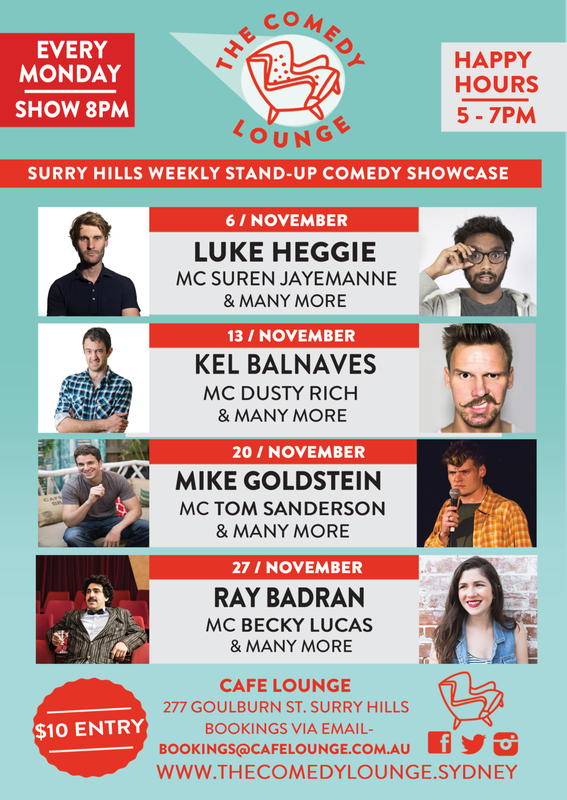 Daniel Connell Headlines both our Monday show at but also our sister show at Waywards, above Bank Hotel in Newtown. Tickets are just $10 each available on the door at Cafe Lounge or pre sale or door for Waywards Comedy. December! Oh boy! Another year in the bag! Massive shows to see in the year. It's truly or busiest time of the year. So get in early for the best seats to avoid disappointment. We have limited reservable seating if you email bookings@cafelounge.com.au (must arrive by 7pm at the latest) but there is plenty of seating as long as you arrive in plenty of time, and why wouldn't you Cafe lounge has great food options and we have happy hrs from 5 to 7pm. Photos from our Big 7th Birthday Bash! We turn 8 this month! That's 168 in comedy room years! Come celebrate with us at any or all of our October shows. They're all gonna be ace! Shows of Joy & Happiness! August / Sept 2017!